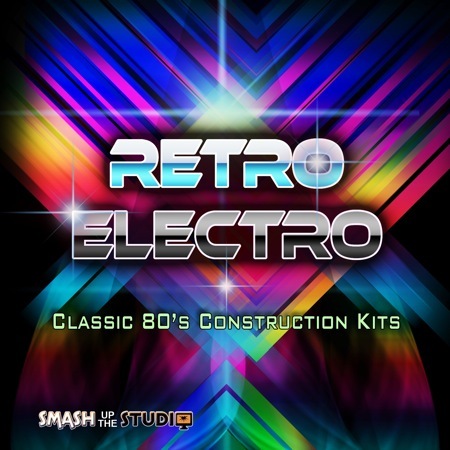 Classic retro electro construction kits and synth loops from Smash Up The Studio. Inspired by the 1980's this collection perfectly captures the sounds and styles of the era using vintage analogue equipment. Retro Electro re-visits the 80's with 3 superb construction kits and a stack of synth loops. The synth loops have been painstakingly sculpted and performed to accurately re-create with authenticity the feel of those great sounds of the time. There are soaring lead lines, moody basses, hard sequences, melody hooks and FX. All loops are key and tempo labelled and range generally between 4 and 16 bars in length, and between 95 and 160 BPM. The Construction Kits contain all the loops used to make the 3 tracks featured in our demos. All the synths, bass lines, drums and FX have all been broken down into separate loops and samples so the user can arrange each track to suit their own personal requirements. Formats include 24 bit Wav and Apple Loops, Rex2 loops and all the synth and bass parts are also available as Midi so you can assign your own synths and plug-ins and benefit from additional editing flexibility if desired. Please Note: Some of the loops have deliberately not been snipped at the end of the bar. This is to let the natural ambience and decay of the sound end naturally. Available in 24 bit Wav, 24 bit Apple Loop, Rex2 and Midi formats. These kits feature all the loops and samples from the 3 tracks in the demos. 50 bonus synth loops and FX. Available in 24 bit Wav, 24 bit Apple Loop and Midi formats. Pack Size: 846.9 MB ( unzipped ) 362 files in total.